Designed specifically for K–12 teachers, this guide provides a sequential approach to implementing standards-based education in the classroom. Transition to more effective instructional strategies and use standards-based grading and assessment methods to better measure student learning. Explore the theories and benefits of a standards-based curriculum. Become familiar with several significant paradigm shifts that will help you make a strong transition to a standards-based classroom. Explore ways to shift your thinking about teaching and lesson plans in order to better understand content as a vehicle for the achievement of standards. Learn how to develop proficiency scales that will offer guidance in teaching to standards and establishing informative classroom assessment for student learning. Discover new styles of instruction, educational assessment, feedback, and curriculum building that are well suited to standards-based education. Understand how to develop student ownership through the setting of goals. Access free downloadable reproducibles available with this book. Buffum, A., Mattos, M., & Malone, J. (2018). Taking Action: A Handbook for RTI at Work. Bloomington, IN: Solution Tree Press. Chapman, C., & Vagle, N. (2011). Motivating Students: 25 Strategies to Light the Fire of Engagement. Bloomington, IN: Solution Tree Press. Conzemius, A. E., & O’Neill, J. (2013). The Handbook for SMART School Teams: Revitalizing Best Practices for Collaboration (2nd ed.). Bloomington, IN: Solution Tree Press. DuFour, R., & Marzano, R. J. (2011). Leaders of Learning: How District, School, and Classroom Leaders Improve Student Achievement. Bloomington, IN: Solution Tree Press. Heflebower, T., Hoegh, J. K., & Warrick, P. (2014). 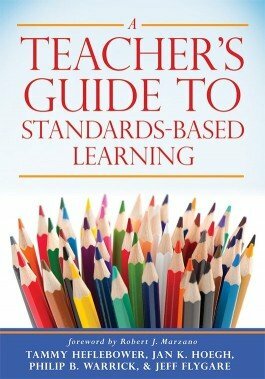 A School Leader’s Guide to Standards-Based Grading. Bloomington, IN: Marzano Research. Marzano, R. J. (2010). Formative Assessment & Standards-Based Grading. Bloomington, IN: Marzano Research. Marzano, R. J. (2017). The New Art and Science of Teaching. Bloomington, IN: Solution Tree Press. Marzano, R. J. (2018). Making Classroom Assessments Reliable & Valid. Bloomington, IN: Solution Tree Press. Marzano, R. J., Heflebower, T., Hoegh, J. K., Warrick, P., & Grift, G. (with Heckler, L., & Wills, J.). (2016). Collaborative Teams That Transform Schools: The Next Step in PLCs. Bloomington, IN: Marzano Research. Marzano, R. J., Norford, J. S., Finn, M., & Finn, D., III. (with Mestaz, R., & Selleck, R.). (2017). A Handbook for Personalized Competency-Based Education. Bloomington, IN: Marzano Research. Marzano, R. J., & Pickering, D. J. (with Heflebower, T.). (2011). The Highly Engaged Classroom. Bloomington, IN: Marzano Research. Marzano, R. J., Warrick, P. B., Rains, C. L., & DuFour, R. (2019). Leading a High Reliability School. Bloomington, IN: Solution Tree Press. Marzano, R. J., Yanoski, D. C., Hoegh, J. K., & Simms, J. A. (with Heflebower, T., & Warrick, P. B.). (2013). Using Common Core Standards to Enhance Classroom Instruction & Assessment. Bloomington, IN: Marzano Research.